Currants naturally possess a perfect combination of pectin and acidity, which ensures a good jell without the need to add commercial pectin. The result is a delicious jam with a color as brilliant as that of the fruit. While the jars are sterilizing, put the red currants and water in a large, non-reactive pot (no cast iron unless it is enameled, and no aluminum). Gently crush the currants with a potato masher or the bottom of a wine bottle. Add the sugar. Cook the mixture over medium-low heat, stirring constantly to dissolve the sugar. Once the sugar is completely dissolved, raise the heat to high and boil, stirring often, until the jam reaches the jell point. 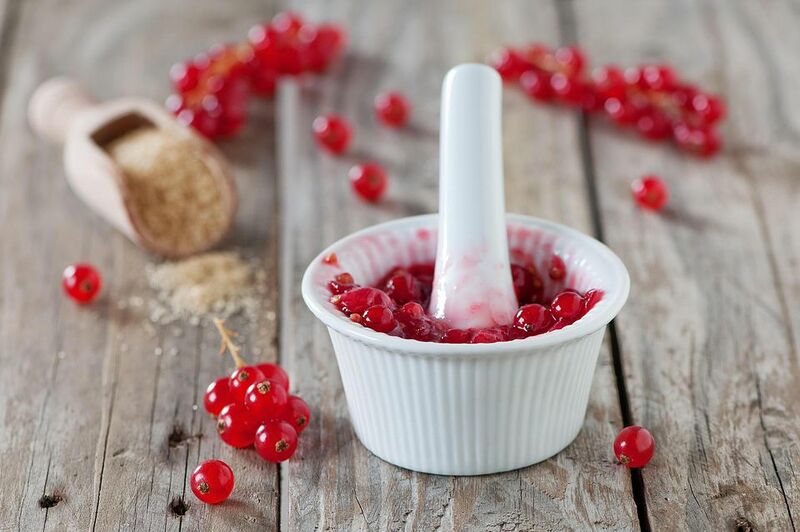 Remove the red currant jam from the heat and skim off any foam that has formed on the surface. If the jam reaches the jell point before the jars are sterilized, simply remove the jam from the heat until the jars are ready. Reheat the jam just barely back to a simmer before filling the jars. Ladle the hot jam into the sterilized jars leaving 1/4 to 1/2-inch headspace. Screw on canning lids. You can simply allow the jars to cool and then store them in the refrigerator for up to 3 months. For longer term storage at room temperature, process the jars in a boiling water bath for 5 minutes. *Freeze the currants, still on their stems, before the first step. It will be easier to remove them from the stems when they are frozen. No need to thaw the fruit before proceeding with the recipe. Keep in mind that as with all jams, red currant jam will firm up as it cools. It will still be somewhat runny while it is still hot. Jars of red currant jam that have been processed in a boiling water bath will keep, unopened, for up to one year. The jam is still safe to eat after that, but the quality will decline. Once opened, store the jars in the refrigerator just as you would with store-bought jams.